If you’ve been to the UT President’s Office recently, you can’t help but notice it in the western stairwell. (And if you haven’t seen it, I recommend a visit.) It’s been a popular, colorful addition to some new University publications, and has served as a backdrop for portraits of all types. It’s the Ashbel Smith stained glass window. Over a century old, it was almost lost in a spring hailstorm in 2008. This summer marks the fifth anniversary of its rescue and restoration. 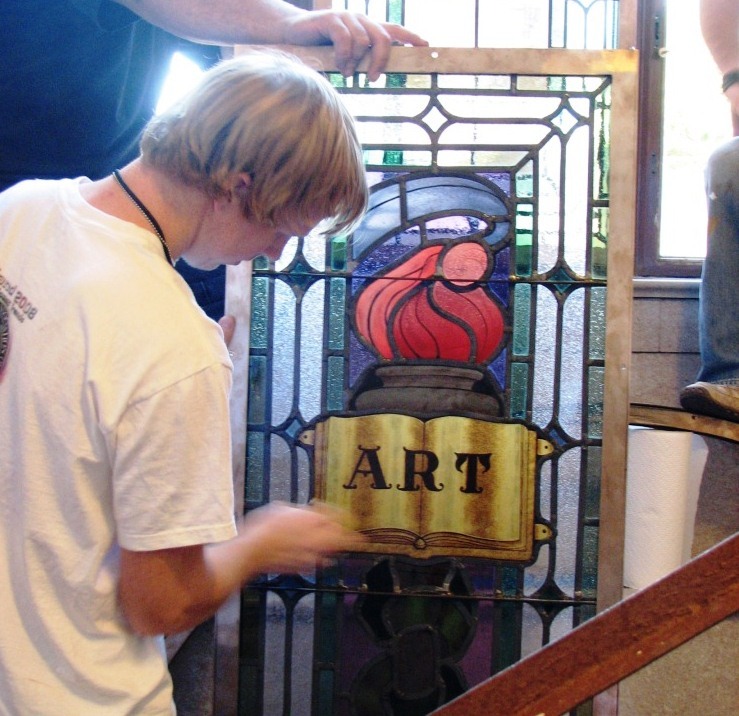 The window itself was designed by Harry Goodhue of Cambridge, Massachusetts, one of three master artists who ignited an American revival of Medieval-styled stained glass windows in the early 20th century. Born in 1873 in Connecticut, Harry’s older brother was Bertram Goodue, a nationally renown architect known for his Gothic and Spanish Revival buildings, which included designs at Cal Tech and the University of Chicago, as well as the Nebraska State Capitol. Harry got his start creating windows for his older brother’s Gothic-styled churches. 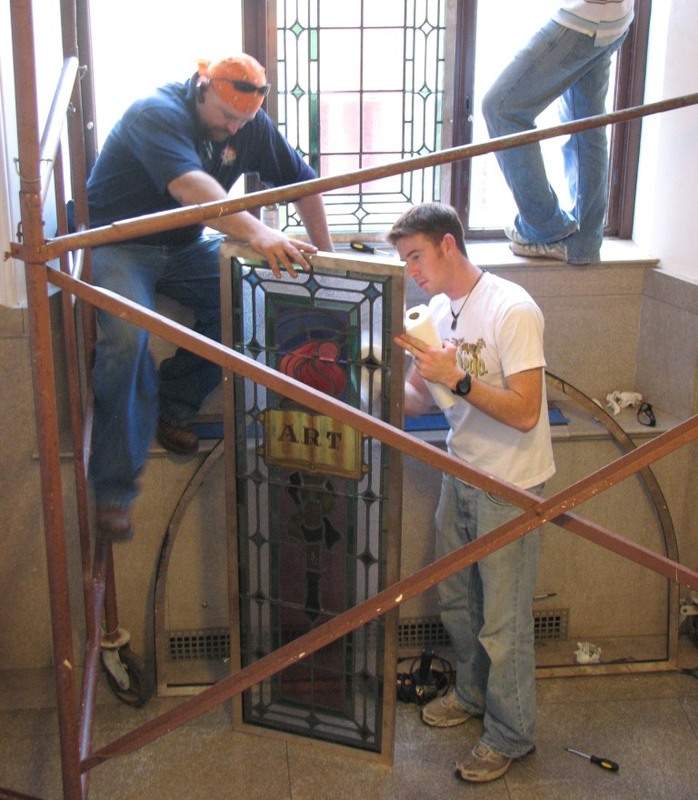 When Old Main was razed in the mid-1930s and replaced by the current Main Building and Tower, the window was saved and installed in the stairwell between the third and fourth floors of the front section of the building. Originally, the Main Building served as the University’s central library, and the fourth floor housed the rare book collections. In the early 1970s, as the Harry Ransom Center became the rare book depository, President Stephen Spurr remodeled the floor as his office suite, and it has since remained the headquarters for UT presidents. 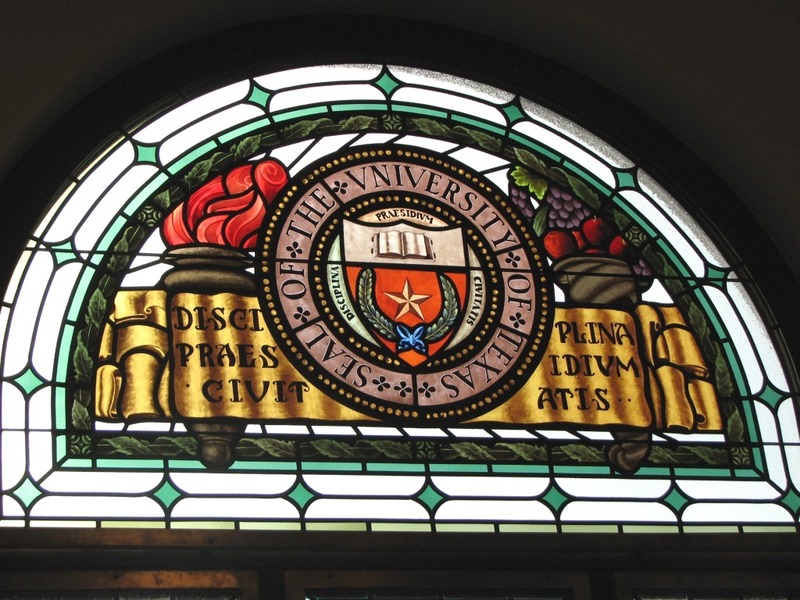 At some point in the mid-1980s – no one seems to know exactly when – the top part of the window, which featured a color rendition of the University seal, disappeared, and the remaining space was covered. The window was likely broken (perhaps by inclement weather), but it wasn’t reported in the news, and it’s been difficult to uncover any details. In May 2008, less than a week before spring commencement, a heavy thunderstorm rumbled through Austin, and brought with it enough large hail and wind to cause damage all over town. Campus landscapers, which had been getting the grounds spruced up for graduation, scrambled to clean up the blanket of leaves, twigs, and branches left by the storm. The hail severely damaged the greenhouse next to the Biological Sciences Building and punched holes in windows all over campus, particularly in the Tower. 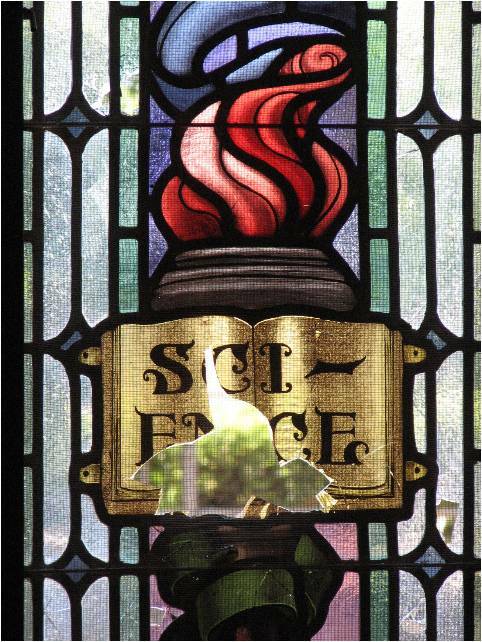 Unfortunately, the Ashbel Smith window was a casualty, as holes were punched in the remaining portions for Arts and Sciences. 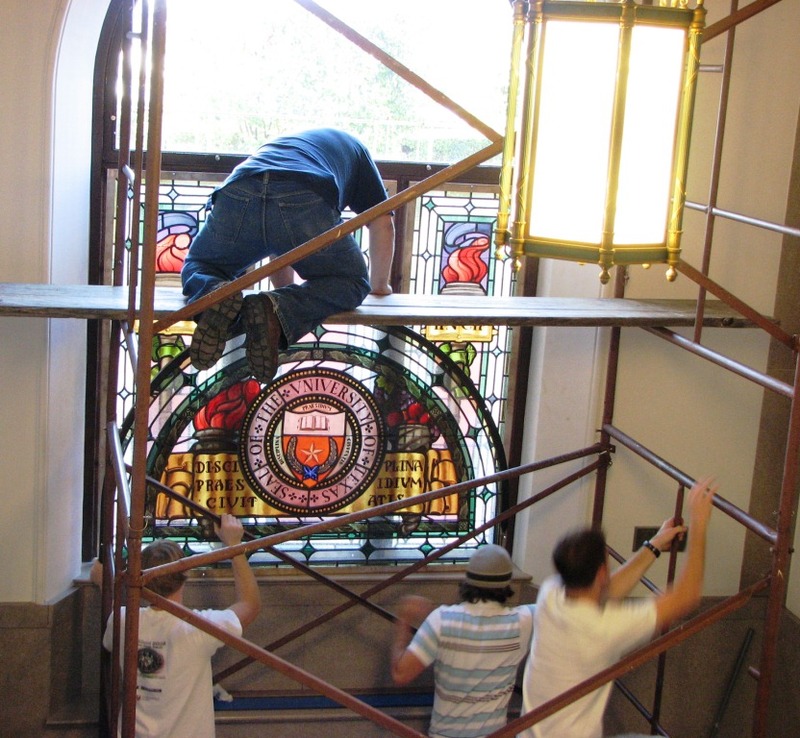 To the rescue came the staff of the Campus Planning and Facilities Management office, which found a local contractor who not only could repair the damaged portions of the window, but could recreate the missing top section. 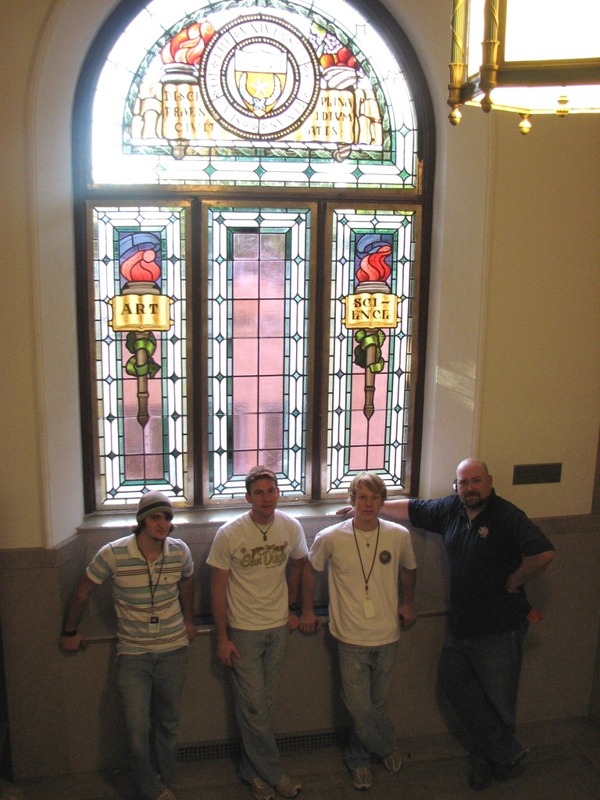 Using photos and drawings from the University Archives at the Briscoe Center, the entire window was completed and re-installed in August 2008, a few months before its 100th anniversary. To guard against future hailstorms, a clear protective window was placed on the outside. 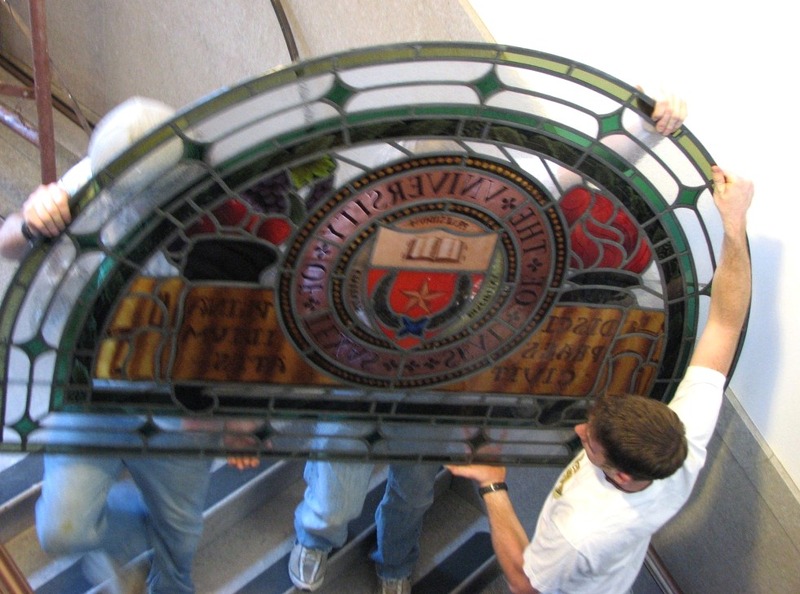 Above and below: August 2008 – The restored Arts and Sciences windows received a final cleaning before being returned to their familiar places. Click on the images for a larger view. All installation photos are courtesy of Dr. Fran Gale. Carefully lifted up the stairs, a new top section, designed to replace the original missing since the 1980s, was recreated from images found in the University Archives. The installation crew had to maneuver in tight quarters in the small stairwell. 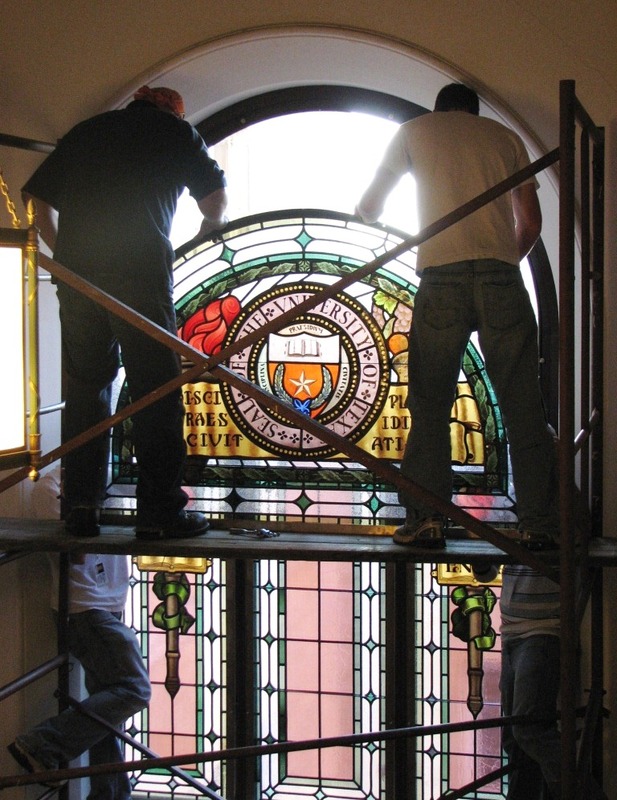 After more than two decades, the Ashbel Smith window was complete once again. The installation crew posed with the final product. Jim, I’m so very glad you did this. The day I called Mr Eckhardt to ask him if he knew why the top was missing, he nearly had a heart attack! He hadn’t seen it and didn’t know about it. We guessed at the time that somebody thought that was the true color of orange that we accepted, but who knows.